DALLAS – It’s been said that a picture is worth a thousand words. 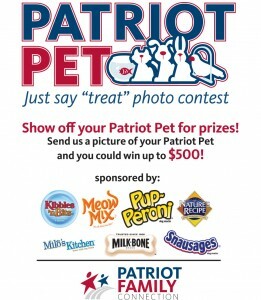 In the Army & Air Force Exchange Service’s Patriot Family “Just Say Treat” contest, a pet picture and 50 words could be worth $500. From May 4-31, pet owners can submit a photo of their furry friend, along with a 50-word or less description, for a shot at the $500 grand prize. Authorized Exchange shoppers can find out more and enter the Patriot Pet “Just Say Treat contest at www.shopmyexchange.com/patriotfamily. This entry was posted on Thursday, May 3rd, 2012 at 16:19	and is filed under Press Release. You can follow any responses to this entry through the RSS 2.0 feed.